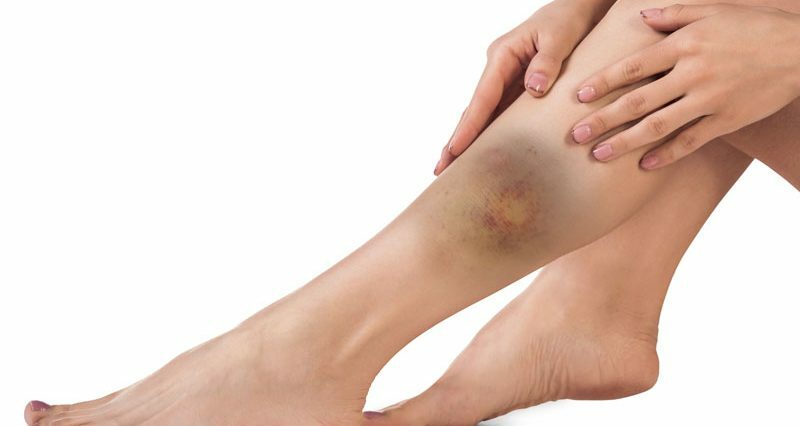 A contusion is caused by a direct impact or trauma to a muscle. Bruising may or may not be visible. Calf contusion symptoms will include an obvious instant pain on impact which may vary in severity from a niggle to a disabling pain depending on how bad impact is. For a bad contusion, the athlete may have loss of function and be unable to walk or run properly. The area will be tender to touch and there may be a pain when stretching the muscles. Bruising may appear but this is not always the case if the bleeding is contained within the muscle sheath. Rest is important. Immediately following injury the principles of PRICE or rest, ice, compression, and elevation should be applied. Ice or cold therapy should be applied as soon as physically possible and for 10 to 15 minutes every hour during the acute stage. This is usually the first 24 to 48 hours depending on how bad the injury is. Ice should not be applied directly to the skin as ice burns can occur but use a wet tea towel. Commercially available hot and cold packs are often more convenient to use in the long run. A compression bandage or support can be worn to reduced bleeding and swelling and elevating the limb will help bruising and tissue fluids drain away from the site of injury. When comfortable to do so, gently stretching exercises for the calf muscles can be performed. With a contusion though rest until it is not painful is the priority. Sports massage can be used after a minimum of 3 days (to ensure bleeding has stopped). This can help relax the muscles and disperse waste products. However, if sports massage is applied to a muscle which has suffered a contusion then a complication called myositis ossificans may occur. This is where there is a bony growth within the muscle and can be very difficult to treat. Below is an example of rehabilitation guidelines. We recommend seeking professional advice before starting any rehabilitation. Maintain and improve both mobility and flexibility. Gentle calf stretching – hold for 30 secs, repeat 5 times daily. Calf raise exercises – 4 sets of 10 repetitions 3 times a week. Gradually build up the weight to strengthen the calf muscles. The athlete should ease down your training for a week or two but no need to stop unless there is pain. Improve mobility with ankle mobility exercises (as long as it is not painful). From day three (not before) apply heat (hot water bottle, hot baths, see a specialist for ultrasound). From day 7 start calf raise exercises (4 sets of 10 reps three times a week). Swimming 2 to 3 times a week. Cycling 2 to 3 times a week. Begin stretching (hold stretches for 30 secs, 5 times a day). From day 14 start to jog and slowly get back into your sports activities. Week 1: The athlete should seek medical attention immediately. R.I.C.E. (Rest, Ice, Compress, Elevate.) Use crutches. Week 2: Pain-free static contractions ( if it hurts don’t do it). Heat with a hot water bottle, hot bath or ultrasound. Double leg heel drop exercises if pain allows. Use no weight and do 4 sets of 10 reps every day. Week 3: All of the above plus straight leg raises with weights. 4 sets of 10 reps 3 times a week. Week 4: Pain-free leg extension exercises, 4 sets of 10 reps 3 times a week. Swimming 2 or 3 times a week. Cycling 2 or 3 times a week. Start stretching exercises, hold for 30 secs, 5 times a day. Week 5: Start jogging. Start squats, 4 sets of 6 to 8 reps 2 days a week. Gradually build up to sports specific exercises. If gentle pressure is applied to the foot, and an angle of 90 degrees should be possible without needing to force it. The Soleus muscle is tested in the same way but with the knee bent. By bending the knee, the larger gastrocnemius muscle is shortened, leaving the soleus which attaches below the knee to be stretched. It is rare that the soleus muscle will be tight, however tight gastrocnemius muscles are more common. This type of stretching will be the safest to use in the early stages of rehabilitation. It involves pulling the foot and toes up gently to stretch the muscles at the back of the leg. Hold for 5 seconds, repeat 5 times. Stretch if pain allows throughout the day. This is done by placing the heel of the back leg on the floor and stretching forwards. Hold for ten seconds, repeat three to five times and repeat the set three times a day. Gradually hold the stretch for longer (up to 45 seconds). In addition to the above stretch, this one will stretch the Soleus muscle lower down in the back of the leg. The same principles apply but it is important to bend the stretching leg at the knee. This takes the Gastrocnemius muscle which attaches above the knee out of the stretch. Stretch by standing on the edge of a step and allowing the heel to drop. Hold for at least 15 seconds. The following guidelines are for information purposes only. We recommend seeking professional advice before starting any rehabilitation. This is a gentle exercise to start with using a rehab or rubber resistance band. It is more suitable in the very early stages of rehab as long as pain allows after a severe contusion. Hold a loop of resistance band and use it to apply resistance as you point the foot away or plantarflex the foot. Start with just 2 sets of 10 once a day and build up to 3 sets of 20 twice a day. If it does not hurt the next day then increase the resistance by shortening the section of band. If there is any pain during, after or the next day then reduce the load or rest a bit longer. Play Plantar flexion with band video. This is a gentle exercise that will strengthen the soleus muscle which is the smaller muscle lower down. This is also an early stage rehab exercise as it can be done with no weight at all, to begin with if necessary. Sit on a chair with the knees bent and lift your heels off the ground as high as possible. Resting a weight on the knees will increase the resistance. Start with 2 sets of 10 once a day and increase a little every two or three days when you are sure there has been no adverse reaction (pain). Play Seated calf raise video. Stand on a step with the heels off the back of the step making sure you have something to hold onto for balance. Lower the heels just below the step then raise up onto tiptoes. Start with 2 sets of 10 reps provided it is pain-free and gradually build up to 3 sets of 20 reps. If after a few days this feels easy, transfer more of your weight on to the injured leg and then go on to single leg calf raises. This exercise can also be done leaning against a wall if a suitable step is not available. To isolate the soleus muscle the calf raise exercise can be done as above but with the knee bent to 45 degrees which puts more load onto the soleus muscle. This exercise is more suitable for the later stages of rehabilitation when the athlete is attempting to return to more specific sports training. The athlete steps back and then in one movement step back onto the step. This is a more explosive, plyometric exercise related to the specific demands of sport. It works the calf muscle eccentrically during the stepping back phase and plyometrically as they push off. The athlete should be capable of normal running before starting this exercise. Alternate so both legs are exercised and do not do any more on the good leg than you can achieve with the injured leg. Play Step back calf exercise video. A calf contusion can be treated with sports massage after the bleeding has stopped. It can help to break down adhesions and increase muscle flexibility, as well as flushing away waste products. However, it is very important massage is NOT done just after a contusion as this can make it worse and cause more serious injury. The following sports massage guide is intended for information purposes only. We recommend seeking professional advice before attempting any self-help treatment. A firm, flat surface to lie on in order to apply pressure. The floor, or preferably a massage table is the best surface. A bed is unlikely to provide a firm enough surface to work on. Aim – light stroking to warm up the area in preparation for deeper techniques. With the hand’s stroke lightly but firmly upwards from just above the heel to the back of the knee. Always stroke upwards towards the heart as this is the direction of blood flow. The other way can damage veins. Then lightly bring the hands down the outside of the leg keeping them in contact but do not apply pressure. Repeat the whole movement using slow stroking techniques, trying to cover as much of the leg as possible. Aim – kneading movements to manipulate and loosen the muscle fibres more. With the hands apply a firm, kneading technique. Try to pull half the muscle towards you with the fingers of one hand whilst pushing half the muscle away with the thumb of the other hand. Then reverse to manipulate the muscle in the other direction. Work your way up and down the muscle, trying to cover as much of the surface as possible. Apply this technique for around 5 minutes, alternating with light stroking (above) occasionally. Aim – to apply sustained pressure to the muscle, ironing out any lumps, bumps, and knots. With both thumbs together, apply deep pressure up the middle of the calf muscle aiming to separate the heads (sides) of the big gastrocnemius muscle. This technique should be slow and deliberate to ‘feel’ the muscle underneath. Another similar technique is applied with a single thumb, which can be reinforced with a couple of fingers from the other hand if more pressure is required. A great deal of pressure can be applied to this technique. Massage should be deep but not so deep that the athlete tightens up with pain. Aim to cover all the muscles in the lower leg, feeling for all the lumps and bumps. With either a single thumb, a reinforced thumb as shown, apply pressure in a circular pattern to any tight spots, lumps or bumps. Apply 10 to 20 circular frictions at a time and alternate with stripping and petrissage techniques. Frictions can be applied to a specific point in the muscle, or applied over a small area of muscle moving gradually. Again, pressure should be firm but not so deep as to cause the muscle to tighten up with pain. If the therapist finds any lumps and bumps or particularly sensitive spots then apply deep, sustained pressure to these points using the thumbs. A trigger point is a localised, highly sensitive point in the muscle. Increase the pressure on the trigger point until it ranks 7/10 on the pain scale (10 being painful). Hold this pressure until it eases off to 4/10 on the pain scale (usually about 5 seconds). Without easing off with the pressure, increase again until it reaches 7/10 on the pain scale once more. Hold until it eases, repeat once more. This technique is very hard on the thumbs. It is important to keep the thumb slightly bent (flexed) when applying pressure to avoid damaging the joints. The therapist can finish off with more petrissage techniques and then finally effleurage again. The whole process should not last more than half an hour. Massage therapy can be applied every day if it is performed lightly, however, deeper techniques may require a rest day in between to allow tissues to ‘recover’.